The best, quickest way to shave strokes by throwing down a few bucks used to mean getting the right ball or being fitted for a driver. Now, though, it might just be getting some technological gadgetry on your side. Consumer electronics have become a big part of the game of golf and just about every aspect of the game is supported in one way or the other by these devices. Today, they run the gamut of possibilities from helping to analyze a golf swing to giving a golfer the right distance to the pin. There are even a few smartphone apps available to help you in finding a lost ball – which you’ll hopefully need to do less after using some of the following devices! A swing analyzer makes use of sensors attached to the golf club or a golfer’s glove hand. They will measure data about your swing, such as swing speed and plane of the club. The sensors then will send the data to a tablet or smartphone, where an app will analyze the data and provide useful feedback, tips, and even recommend drills. One of the best swing analyzer packages available now is the Blast Motion Golf Replay (MSRP $149.95). You’ll attach the Blast Precision Motion Sensor to almost any golf club’s grip end. 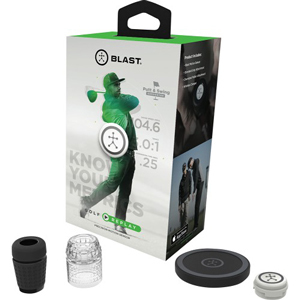 The sensor uses Bluetooth wireless technology to send the data it accumulates to your tablet or smartphone, where the BlastGolf Replay app can display useful stats and analysis. The Blast Motion system uses motion-sensing technology to understand when you’ve moved to begin your swing, rather than forcing you to press a button to begin the recording. Additionally, you can capture the video of your swing and overlay the stats on the screen during playback with the BlastGolf Replay app. A dedicated button allows you to share your swing video and your stats on social media. Video tips built into the system allow you to take steps to fix any errors you may discover in your swing. Ideas for drills are available through the system too. A distance indicator will give you the ability to determine your distance from the pin – no matter if you’re in the fairway, rough, or even an adjacent fairway (we’ve all been there). It can even provide distance to hazards, giving you the confidence to go for it or the caution to lay up. There are essentially two kinds of distance indicators – GPS devices and laser range finders. GPS devices use global positioning satellites to find your location and the distance to previously mapped locations like the front, middle, and back of the green, or a fairway or greenside bunker. Some manufacturers offer handheld devices that are full-featured and similar in size to a smartphone. Others place the GPS technology in a watch or in a sensor that can be clipped to your belt or the brim of your hat. You may even be able to download an app to your smartphone to provide the distance indicator technology – just be careful to not let it drain your battery over the course of a 4+ hour round. You will need to have the golf course you’re playing downloaded onto the distance indicator device you’re using. Most devices have between 35,000 and 40,000 courses available, and you should be able to download new course layouts as the manufacturer releases them. Some manufacturers will even add new courses when customers request them. 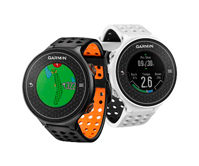 Garmin, which has specialized in GPS devices for automobile travel and for fitness training, makes a few different golf distance indicator devices under its Approach series of products. 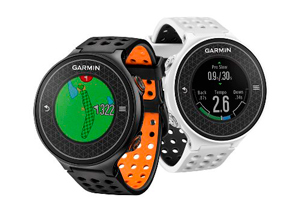 The Approach S6 (MSRP $399.99) is a smartwatch product that includes a touchscreen, hole overview maps, a digital scorecard, and yardage to the green and hazards. It even measures a few swing metrics. Alternatively, laser range finders can provide more precise distances and tend to be preferred by better players where a yard or two of difference can, well, make a difference. Laser range finders require a line of sight to the target. The user simply looks through and eyepiece on the handheld device and when the laser acquires the target, a distance is displayed. Some deer hunters use similar devices to gauge distances, but be careful not to use one of those for golf. A hunting range finder is often calibrated to ignore small targets like twigs and small branches while finding a distance to a solid target (like a deer). Golf range finders are calibrated to pick up small targets like a flagstick. Use a hunting device for golf and you’re likely to not get the distance to the flag, but rather to the backside of the golfers ahead of you as they exit the green! 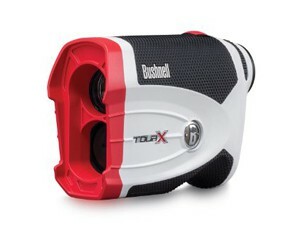 A very popular model in this category is the Bushnell Tour X Jolt Rangefinder (MSRP $499.95) provides tactile feedback in the form of a vibration “jolt” when it positively finds the distance to your target. The optics provide 6x magnification and it can read distances up to 1,000 yards, while providing accurate information to within ½ yard when shooting at flagsticks within 450 yards. It also has a Slope feature which measures the angle of the device and makes adjustments for uphill or downhill shots, giving the “virtual” distance to the flag. Once you have a working knowledge of the distance to the pin with your distance analyzer, you then need to know the average distance you strike each club in your bag. A common problem for amateur golfers is overestimating the distance they can achieve with each club. If you constantly underclub, you’re sure to end up in quite a few hazards, especially around the green. If your home course doesn’t offer human caddies who will give you an honest opinion about your actual ball-striking distances, you can make use of a golf gadget that will act like a virtual caddy. Such a system should help you figure out your actual club distances, reducing the chances you’ll end up underclubbing in the future. Sky Golf’s GameTracker system (MSRP $229) is one easy-to-use virtual caddy option. The system consists of disc-shaped sensors that attach to the end of each of your golf clubs’ grips, as well as a GPS receiver that attaches to your belt. 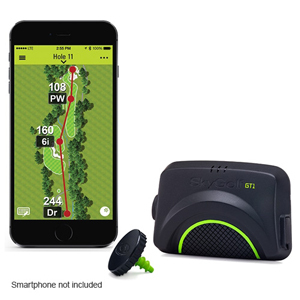 The GPS device works in tandem with the sensors to measure the distance you strike each shot with each individual club during your round, displaying the data on an app on your smartphone or tablet. Once the GameTracker app has enough data stored about your individual club performance and your playing history, it can begin to provide critical stats about your game such as your driving accuracy, driving distance, greens in regulation, scrambling percentage, 3-putt avoidance and more. If you struggle with putting because of an inability to strike the ball squarely each time, keeping it on the proper path toward the hole, having a guidance system can certainly help. OptoSmart Golf has developed the PerfectLine Laser Putting System (MSRP $39.95) or the PerfectLine Integrated Laser Putter (MSRP $79.95), which includes the laser light generator and putter as one unit. You can attach the Laser Putting System to a blade- or mallet-style putter, and it will display a red laser line that runs through the putter’s sweet spot and displays on the golf ball, allowing you to precisely see the center of the ball. 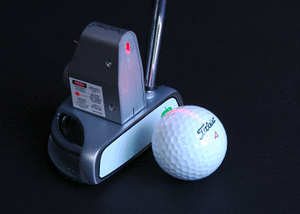 You also can better align the putter and ball to the exact target line you want to use with the laser light. The PerfectLine system works well when practicing putting, as you’ll receive immediate feedback on your swing path with the laser. You can use the system on the putting green to achieve muscle memory on the correct swing path you should follow with your putter, which hopefully will carry over when you’re out on the course. For those days you’re stuck at home (or at work) and want to practice your golf game, a good indoor golf simulator is a must. 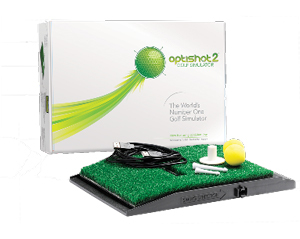 The OptiShot 2 Golf in a Box (MSRP $980) simulator is a system that provides a good mixture of fun and training. Golf in a Box includes the simulator, a ball striking mat, a 4- by 5-foot mat to allow for a proper stance, and strong ball net to allow for striking actual golf balls indoors. The simulator uses 16 infrared sensors in the ball striking mat to measure your club path as you make contact with the ball, providing accurate feedback. You will calibrate the system to work with your golf clubs, increasing the accuracy of the simulator for your personal game. The simulator, which runs on your computer, includes simulations for playing 15 courses. Additional courses are available for purchase. If you’re looking for help with your golf game, the immediate feedback and statistical analysis of the golf gadgets listed here will be a great way to take a step forward while also having some fun with your game. While you may not fall in love with your distance indicator like you might with your favorite driver, you’ll eventually give these gadgets a prime position in your golf bag!